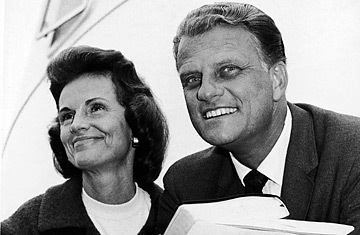 Ruth Graham, 87 wife of evangelist Billy Graham, died today, June 14, 2007 in Montreat, North Carolina. Whenever he was asked how he came to be the greatest evangelist in history, Billy Graham always turned his eyes heavenward: "It was God who did this," he would say. But if there was an earthly power who helped both raise him up and keep his feet on the ground, it was his bright-souled, big-hearted wife Ruth Bell Graham, 87, who fell into a coma and died on Thursday. "Ruth was my life partner," he said in the statement announcing her death. "We were called by God as a team. No one else could have borne the load that she carried." The daughter of Presbyterian medical missionaries in China, Ruth had no intention of getting married, much less to a man who would become one of the most famous in the world. She had seen missionary life up close: the hardship, the loneliness, the danger, as her parents lost colleagues to political violence and Ruth's little brother to dysentery. But she also admired their courage and kindness and aspired to live a life of Christian witness, as an "old maid missionary" in Tibet. She did lead a life of witness, but not the way she planned. She and Billy met when they were students at Wheaton College, when he was already an ordained Baptist minister; "I fell in love right that minute," he said. She liked his earnestness, energy, the muscular message he preached. She came to know his gentleness and sincerity. They courted through college and married right after graduation. Billy was soon traveling the country and the world leading crusades, meeting with Truman and Eisenhower at the White House, with the Queen at Buckingham palace, with Hollywood stars and business moguls. It was a drenching wave of power and celebrity that might have swept away a lesser man; but Billy had Ruth as his firm anchor, teasing him mercilessly to puncture any temptations to pride, matching him verse for verse in his study of Scripture, hauling him back from the cliff whenever he was tempted to dive too deep into the politics that fascinated him so. When rumors circulated in the winter of 1964 that Graham was considering running for the White House, she coolly informed him that "If you run, I don't think the country will elect a divorced president." A few months later she and Billy dined with Lyndon and Lady Bird Johnson at the White House on the eve of the Democratic convention. Johnson began running down his list of possible running mates, wanting to know what Graham thought of them. Ruth kicked Billy hard under the table. "You shouldn’t answer questions like that," said Ruth. "Your job is to give spiritual and moral advice to the President, not political." But when Lady Bird and Ruth got up from the table and went into the living room, Graham recalled, Johnson got up, quietly closed the door, then turned to him and said, "Now, tell me, what do you really think?" There were many temptations facing a man in Graham’s position, and Ruth was vital in helping him resist them. He vowed early on never to be alone in a room or a car with any woman other than Ruth. Members of his evangelical team would enter his hotel room before him, to search it for any adoring fan or tabloid bait that might be hiding out. Once a society doyenne swooned at Billy at a luncheon: "He is so eloquent and so handsome," she said. "Isn't it a shame that he isn't in politics?" To which Ruth dryly replied, "Maybe the Lord thought politics had its share and decided to give the ministry a break." A woman of deep mercy and vibrant faith, Ruth was a gifted evangelist in her own right. Her ministry was far more private, counseling inquirers individually at Crusades, writing books and poetry, sharing the gospel with the ever wider circle of friends and acquaintances, including the First Families. She became quite close to Lady Bird, and then to the Nixons, and especially the Bush family. Ruth and Billy stayed at the White House with the Nixons the weekend before Christmas in 1973, as scandal consumed the country, and the First Family. "I was feeling the strain of over six months of Watergate," Julie Nixon Eisenhower recalled, "and more important, I was facing the fact that after years of searching I still did not have a deep spiritual base in my life." She and Ruth sat for a long time in a little sitting room, talking about how to study the scriptures; she marveled at Ruth's Bible, so worn and underlined, with notes in every margin. "She led the kind of life I wanted to lead," Julie said. Ruth put her in touch with a congressman's wife who could include her in their weekly Bible study. Barbara Bush and Ruth Graham shared an extensive correspondence over the years and a great deal more: both were strong-willed and outspoken women who married young and found themselves responsible for large families while their husbands moved in ever-widening circles around the world. Both women also looked out for their sometimes too-trusting spouses. And each could unholster a wicked sense of humor when she needed it. In 2006 Barbara noted that Ruth had once been asked whether, as a Christian, she had ever contemplated divorce. Barbara explained, "Her answer, was, 'Divorce? No. Murder? Yes.'" Added Barbara, "I could understand that." Ruth brought to their union just the right skill set to manage a household as unusual as hers. She liked to tell their five children that "there comes a time to stop submitting and start outwitting"  a rule that applied to herself as well, such as when she tried to hide a broken arm from Billy because she didn't want him to know that she had gone hang gliding. She created the safe place, the sanctuary for her husband and children to guard them from the life of fame. By the mid-1950s it was no longer possible to live in a house where tourists could walk up to the windows and peer in (the kids once tried charging a nickel to anyone wanting to take a picture.) So they bought 200 acres on top of a mountain in Montreat, and she proceeded to build their house out of the logs she had salvaged from old cabins and barns being torn down in the area. She furnished it with antiques and the treasures of their years of world travel, and it was in this home, in her warm room with its glowing fire, that she passed her last days. On May 31, when three former presidents and thousands of friends came to pay tribute to her husband at the dedication of his Library in Charlotte, there was a chair up front reserved for her; but she could not make it, Billy explained sadly to the crowd, for she was now so frail, her spine degenerating, and her time was coming. "Ruth is my soul mate and best friend," Billy Graham said, "and I cannot imagine living a single day without her by my side."